Hot off the heels of their announced inclusion in the Injustice: Gods Among Us roster yesterday, Warner Bros. has put together a new trailer for the promising new fighter that shows gameplay footage of both Nightwing, Cyborg, and everyone else we've seen up to this point. And you know what? I'm thinking Nightwing might end up being my main go-to character when the title launches next year. I love how agile he seems to play. Cyborg looks like a lot of fun, but I don't think he's my kind of character. Steven Hansen and I were able to check out Injustice back at E3, and this trailer shows off quite a few things we didn't even realize you could do. We noticed that the stages would react chaotically to the actual fighting, but I had no idea it was possible to actually interact with the environment. One example of this is when Batman gets thrown into an ice pillar in the background. 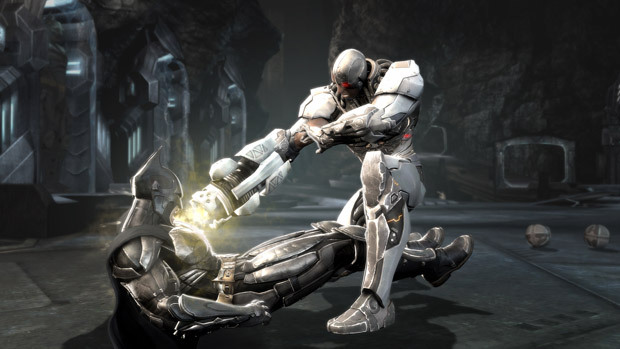 A lot of people think Injustice is going to be a Mortal Kombat clone, but it really is its own beast.